The 5.11 Tactical Single Pistol Bungee/Cover offers full compatibility with both MOLLE-based web gear and our proprietary SlickStick System, allowing you to customize magazine storage for the mission at hand. 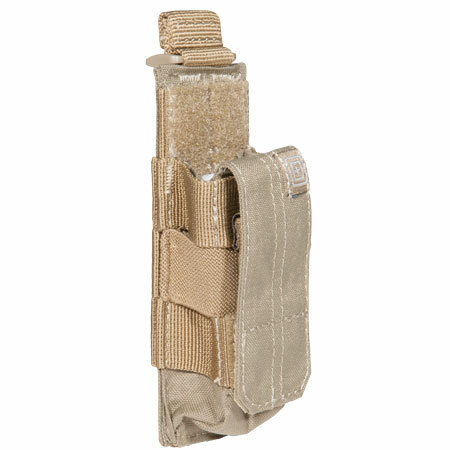 With a modular, stackable design and an option for either standard flap cover or bungee cord retention, this lightweight, high performance magazine retention pouch operates quickly, quietly, and effectively in any situation. A water repellant coating and durable Duraflex hardware ensure smooth and reliable operation in wet or cold climates. DIMENSIONS: 5.25" x 1.50" x 1.25"